Read Avoid Blooming Back Pain This Year! by Dr. Paul Miller to learn more about Advanced Chiropractic and our Chiropractic office in Spokane, WA. Gardening weather is finally here! Although we are invigorated by the warmth, gardening can provide a great workout but with all of the bending, twisting, reaching and pulling, your body may not be ready for these better home and garden activities. Just remember gardening is a full-time summer activity and to use these warms ups before any full landscape session to avoid blooming back pain. 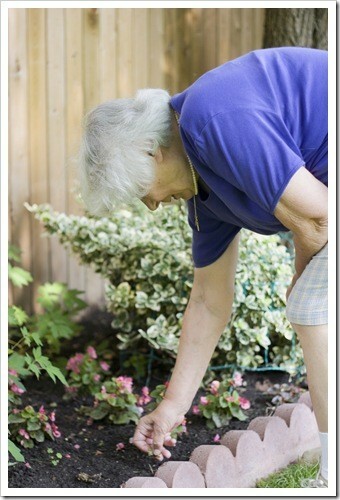 To enjoy gardening fully it is important to stretch your muscles before reaching for your gardening tools. The back, upper legs, shoulders, and wrists are all major muscle groups affected when using your green thumb. Following these simple stretches will help to alleviate muscle pain after a day spent in your garden. Before stretching for any activity, breathe in and out, slowly and rhythmically; do not bounce or jerk your body, and stretch as far and as comfortably as you can. Do not follow the no pain, no gain rule. Stretching should not be painful. Begin your stretch by sitting and prop your heel on a stool or step, keeping the knees straight. Lean forward until you feel a stretch in the back of the thigh or the hamstring muscle. Hold this position for 15 seconds. Do this once more and repeat with the other leg. Do the “Hug your best friend.” Wrap your arms around yourself and rotate to one side, stretching as far as you can comfortably go. Hold for 10 seconds and reverse. Repeat two or three times. Finally, be aware of your body technique, body form and correct posture while gardening. Kneel, don’t bend and alternate your stance and movements as often as possible to keep the muscles and body balanced. Better Home and Garden Success! A healthy body like a healthy garden takes preparation and loving care. Schedule a spinal check up and address any unwanted weeds that may be taking root in your most valuable asset your health. This entry was posted on Tuesday, August 21st, 2018 at 9:17 pm and is filed under Health Articles. You can follow any responses to this entry through the RSS 2.0	feed. You can skip to the end and leave a response. Pinging is currently not allowed.